Annabelle Jones (Heidi Armbruster) and Jane Mason (Angela Pierce) are journalists who are there for each other in "Love Goes to Press." Photo by Richard Termine. THE rom-com formulae are as old as theater, and they never fail to entertain. “Love Goes to Press,” created by Martha Gellhorn and Virginia Cowles for a West End run in 1946 as a lark, has a piquant take on the familiar. It is playing at the Mint Theater Company through 29 July. At the time of the writing, MG was divorced from Ernest Hemingway. VC was newly married to British journalist Aidan Crowley. The women knew of what they wrote. 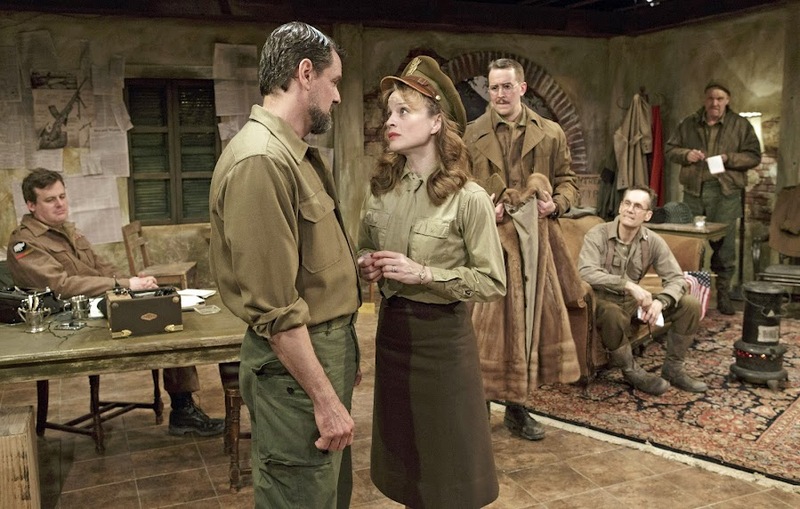 Like the play’s authors, the heroines in “Love Goes to Press” are journalists on the frontline of war. Bradford Cover (seated), Rob Breckenridge, Margot White, David Graham Jones, Curzon Dobell and Jay Patterson in “Love Goes To Press.” Photo by Richard Termine. More drama ensues when in a case of mistaken identity press liaison officer Capt. Alastair Drake (Peter Cormican) puts Daphne in harm’s way, allowing Jane – who was the intended target – a heroic rescue. Romance blossoms and wanes in “Love Goes to Press.” The acting never falters for a moment; nor does the direction by Jerry Ruiz. This blog should be called Tamara's Pen! Hello ... I appreciate your comment. You may read "TAMARA'S" PEN at http://tbontheaisleatheaterdiary.blogspot.com/. Meanwhile, I invite you to read deeply into my online lifestyle "newszine," VEVLYN'S PEN, and you will discover that it takes a village, not just one person. I feel fortunate to have Tamara B, her namesake, Tamara Fish, and others contributing to what I believe is one of the best "boutique" online lifestyle magazines on the Web, if I may say so myself. Thank you and do come back.